Anyone are dreamed of knowning of the Format Factory Alternative for Mac? If you are a Mac user and looking for Format Factory for Mac, you can turn to some programs similar to Format Factory on Mac. Anyway, if there Format Factory for Mac that functions the same or come close? Absolutely. In this article, I’ll share one such amazing tool that enriches and deepens your digital life for Mac & Windows . For mac users, it is also important to get an alternative mac to the popular MediaCoder, Freemake Video Converter and MPEG Streamclip. Reason One: Format Factory is considered the best free all-in-one DVD and video converting software for Windows by many people. It can even rip DVD to your Windows computer or iPhone, iPad, iPod so that you can enjoy DVD movies on the go. However, it’s unfortunately that such a powerful and useful tool doesn’t support Mac OS X. It’s worse that there isn’t a scheduled plan to develop Format Factory for Mac. a. It utilizes huge CPU usage during conversion process. b. The DVD conversion speed is low and output quality is not satisfactory. c. Only support Windows operating system. d. It has a bunch of ad-ons that is shown during installation, which some considers to be spyware. 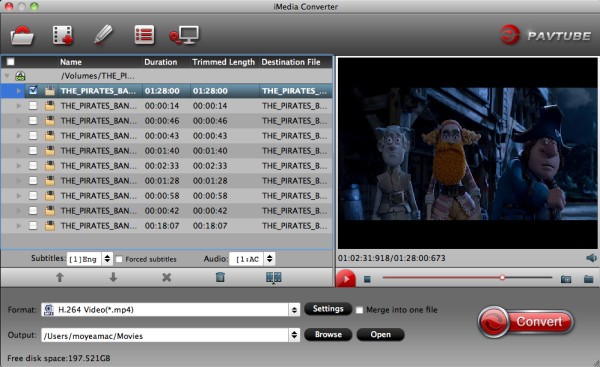 The best alternative to Mac Format Factory for converting DVD and videos I can recommend is iMedia Converter for Mac. It can rip and convert any DVD even Blu-ray movie to any format such as MP4, AVI, WMV, FLV, MKV, MOV, etc through Mac OS Sierra. Moreover, it allows you to convert between all popular video/audio formats for playback anywhere you like. Here is review. Well, if you are seeking for a Format Factory for Windows, please turn to Pavtube Video Converter Ultimate. Below, we will show you how to convert your DVD and video to any regular video/audio format easily with the best Format Factory for Mac alternative. Hot News! Pavtube Studio has launched a user-requested upgrade for full line of Pavtube products to Windows version 4.9.1.0. Existing bugs, improvements and new elements for M3U8 encoding are added. Launch Format Factory for Mac alternative first. Click the “Add Video” button to import your local video files and click the disc button to import DVD files for converting. Or you can directly drag the videos you want from your Mac to this program. Click the “Format” icon, and then go to the right category to find the video format you want. As you can see, various video formats like MP4, MOV, MKV, FLV, WMV, AVI, etc. are provided. 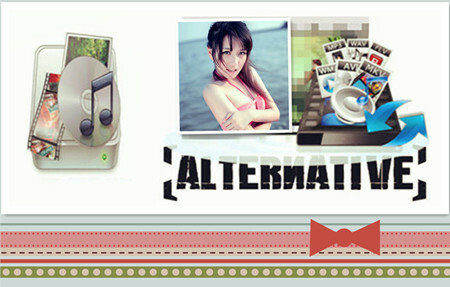 You can also choose the icon of iPhone, iPad, iPod, iMovie, Final Cut Pro, Samsung, Android, etc. to get videos with best settings for the selected device/software. Tip: If you want to customize the output video quality, you can click the “Settings” button to open the Settings window and set video resolution, frame rate, bit rate, codec, etc. If necessary, you can perhaps try to edit your video files with the alternative Format Factory for Mac. Nothing unfamiliar from the Format Factory, you can also easily cut and rotate/flip your videos and add watermark. In addition to that, you can trim, crop, add effects together with the insertion of subtitles to your video clips. 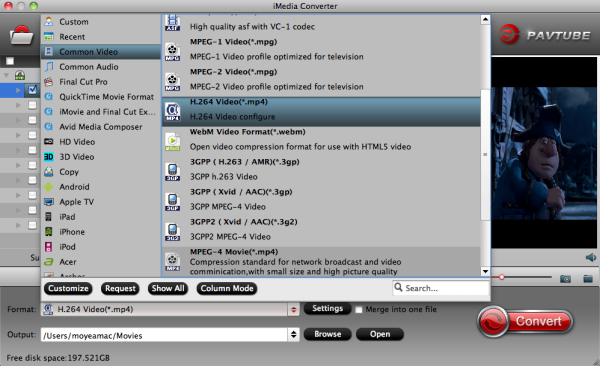 Click the “Convert” button to start converting DVD and videos. You can follow the conversion process from the pop-up Windows. Once the task bar shows in 100%, just click Open button to locate the output files. Hence, you can now transfer and play your video files anywhere and anytime you like it.